Do you remember the time of your childhood during festivals we used to lurk near our mothers waiting for special sweets that used to be prepared? Today I'm going to share a very special sweet called Narkeler Naru (coconut ladoos/ coconut dumplings). 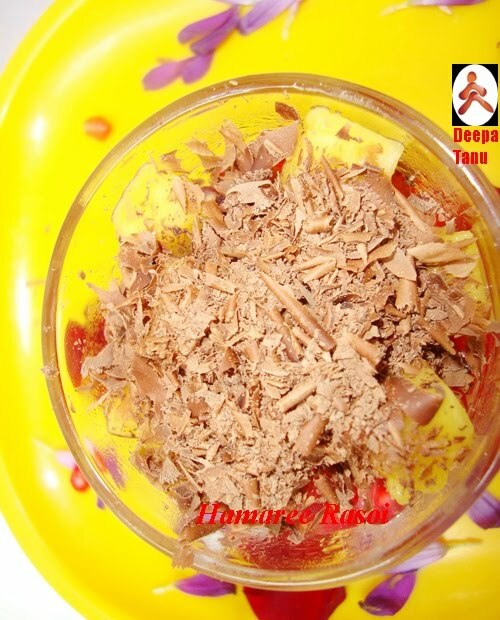 This is one of the most common sweet that we prepare on Lakshmi puja (Lokhi pujoo) and during Durga Puja. We actually used to eagerly wait till the offering of the naru to the Goddess Durga used to get over and just attack them soon after. Sometime I used to grab two hand fulls of the narus and run at the corner so that I don't have to share them with anybody. As you know no Bengali meal is complete without sweets so couldn't resist myself making these. Just like Bengali cuisine, Bengali sweets are known for their variety and diverse ingredients like chana, coconut, nolen gur to name a few. 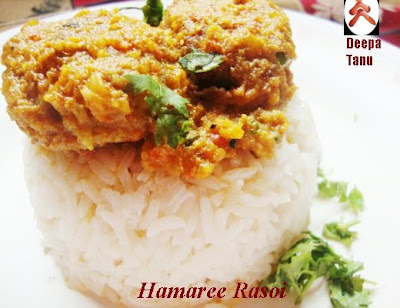 This particular preparation is made by special jaggery produced by date trees in Bengal. Since I made this by 'date jaggery' so the color is deep brown. We get it only in winter season (yeah you guessed it right : this post was lying in my draft for more than 6 months). Nolen Gur is prepared by collecting palm snaps in earthen pots, which are tied in tree tops throughout the night and collected in the morning. When added with milk and cottage cheese it creates as special sweetness and flavor which cannot be substituted by sugar. When in season this jaggery is added in many sweet dishes to enhance the flavor and the taste of the dessert manifold. 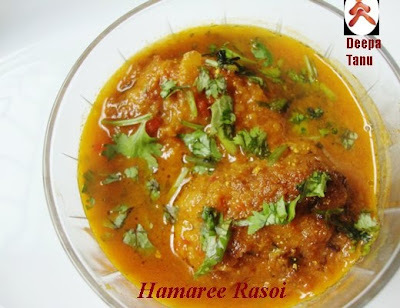 You can easily prepare this by replacing date jaggery with 1 cup sugar (chini-r naru). The taste will be little different but not less by any means. Grate the coconut and keep it aside. Place a heavy bottomed wok on gas top. Pour grated coconut in it, add 1tbsp sugar and jaggery. Keep stirring this on medium flame. Stir continiously till the jaggery melts. Keep stirring the mixture until it feels sticky yet moist and leaves the side of the wok. This part is crucial as over doing it will dry up the mixture. It ought to be moist and hot enough to be rolled into marble sized balls. Smear a bit of ghee on your hand, scoop out a spoonful of coconut mixture and roll into walnut sized balls. Store in an air tight container. Enjoy this simple, delicious coconut balls that is made of just three ingredients. 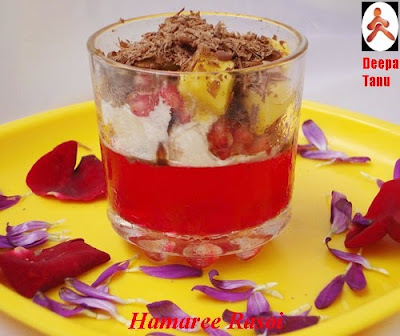 Sending this coconut ladoo to Ayeesha's lovely event "Iftar Moments: Hijri 1431"
read more.. "Narkol Naru Nolen gur diye/ Coconut Marbels/ Nariyal ke Ladoo"
Believe me folks, as soon as I saw her Jell O...with a twist, I just loved it and made up my mind to try to prepare a similar recipe with minute changes in the kinds of fruits that I have added. 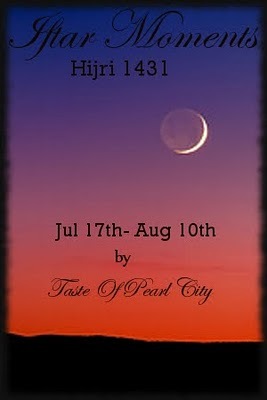 Do check out her blog for more yummy, delicious recipes. 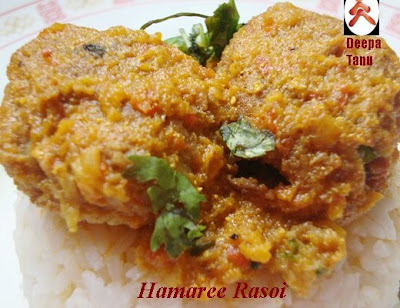 The best part is that there is very less effort put on as compared to the taste of this recipe. Last weekend, I had prepared this dessert and served it to our friends and they liked it very much. Hope you all like it having as much as I have enjoyed in preparing. I have used strawberry flavor here, you may replace it with your choice of flavor. Just follow the instructions written on the packet. Pour the contents in a large bowl and mix well with a spatula. Add hot water and whisk until the powder has dissolved. Also stir in half cup cold water. Carefully ladle the jelly syrups into the serving glasses. Place the jelly syrup in the fridge and let it freeze for 2-4 hours. Remove the jelly filled glasses from the fridge when fully set and serve with scoops of vanilla ice-cream on top. Decorate with chocolate syrup. 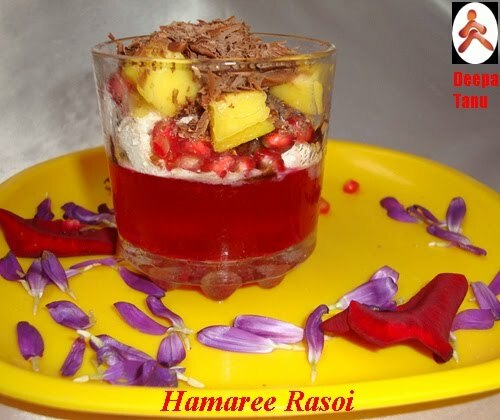 Garnish with fruits and grated chocolate. And enjoy !!!!! 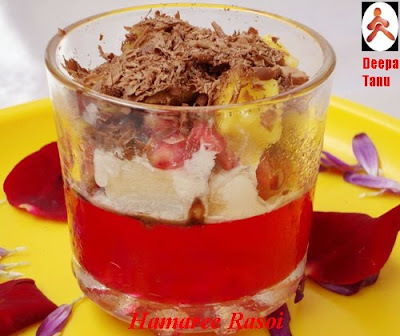 Sending this dessert to Ayeesha's lovely event "Iftar Moments Hijri 1431"
First, a cute award is given by Chaitra of Aathidhyam, a happy blogging award for participating in her Bread Mania event. Thank you so much Chaitra for this cute return gift. 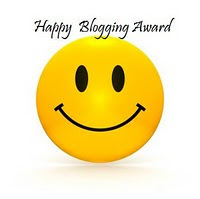 Second award is by another dear friend Jay of Tasty Appetite has shared this beautiful Loving Blogger Award for participating in her first event. Thanks buddy. 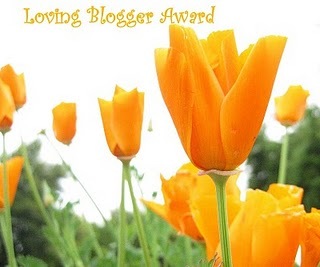 read more.. "Jelly with Ice-cream and few awards....."
I knew that penning down this post is not going to be easy as my mouth is already watering just mentioning the title itself "Butter Chicken". Even I was young and didn't know much cooking, I used to order this particular dish in almost every restaurant. This is perhaps the most popular chicken item in India after chicken tikka. Being a typical Panjabi dish, milk and milk products are generously used. After much trials I have finally invented the simplest way to prepare this dish. Wash the chicken pieces and make incision with a sharp knife on breast and leg pieces of the chicken (this helps in through absorption of the marinated ingredients into the chicken pieces). Make a paste of green chilli, ginger and garlic. Marinate the chicken with all the ingredients and refrigerate for 3-4 hours. To prepare the chicken in oven, pre-heat the oven for 10 minutes on 180 Degree Celsius. Grease the tray well and pour the marinated chicken evenly on the tray and bake for 1/2 hours. To cook it on gas, heat 100 gms butter in a pan and fry the chicken pieces (in batches) till the color turns pink and the chicken is tender. Keep aside for later use. Make a paste of onion and fry it in the remaining butter till it turns pink. Make a paste of cashew and watermelon seeds. Add this paste in the pan and stir fry for few minutes (make sure that the masala does not get burnt or you will not get the desired color). Add tomato puree and fry till the oil floats on top. Add the baked/ fried chicken pieces in the pan and mix well. Pour 1/2 cup milk and stir for 2 minutes. Just before switching off the burner, add cream and stir well. 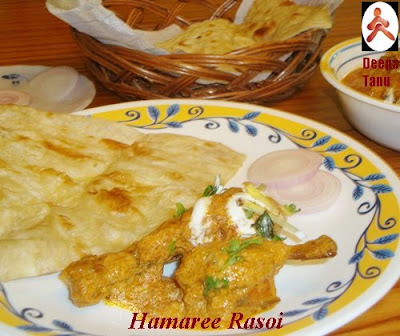 Garnish with the rest of 50 gms butter, chopped coriander leaves and ginger on top.Enjoy this delicious butter chicken with lachha paratha / rumali roti or with plain paratha. read more.. "Butter Chicken / Murg Makhani"
I simply love this date(khajoor) and walnut cake. If not best, this is certainly one of the best cakes that I've made recently. So those who love this combination of date and walnuts please try it once, I'm sure you will like this too. Soak the dates in warm water for 30-40 minutes. Pre-heat oven at 180 Degree celcius (350 F). Grease the oven proof pan with little butter. Sift flour, baking powder, cinnamon, baking soda together for 3-4 times. In the meantime make a paste of dates (previously soaked in warm water) by using very little water. Melt unsalted butter, add vanilla extract, eggs, walnuts and raisins (dust these with flour before mixing else they will simply sit at the bottom) into the batter. Pour this batter and spread it evenly(using a spatula on the top surface). Bake for 40 minutes until skewer comes out clean. Remove from the oven, keep it on wire rack to cool. Just make sure that before cutting it cools down completely. Store the remaining slices in a air tight container to relish later. read more.. "A Date With Walnut Cake :-)"
For koftas: Peel off the outer skin of the bottlegourd and grate it. Squeeze out the water and keep it aside for making gravy. In a large bowl mix all the ingredients for kofta (except oil) and knead to a soft dough. Make small balls out of the mixture. Now heat oil in a deep pan, fry the balls in medium heat till golden brown. Place them on a paper towel to drain excess oil. Keep aside. For gravy: Heat oil in a pan, add cumin seeds, let it splutter, add onions and fry for few minutes. Add ginger, garlic, green chillies and stir for few more seconds. Add tomato paste and fry till the oil comes out. Add all the spices, salt and fry for 1 minute. Add some water and let the gravy boil. Once it is boiled, add the fried koftas and let it cook on medium flame for 10 minutes. Garnish kofta gravy with ghee on top and with chopped coriander. Enjoy this hot lauki kofta curry with plain rice or chappatis/ parathas. The above method that I've mentioned is for immediate serving. If you are not planning to serve kofta gravy immediately, I would suggest you keep the gravy and kofta in two separate bowls untill the serving time. As koftas are very soft and delicate, they soak all the gravy if kept for a longer time in the gravy. Just before serving, heat the gravy for few minutes in microwave and then drop the koftas and again heat it for 2-3 minutes. read more.. "Lauki Kofta / Lao-r Kofta / Bottlegourd Gravy"
Now coming back to today's recipe, this used to be my favorite lunch box item during my school days. I used to feast on these yummy flaky parathas, more so because these leaves were picked up by my Dad early morning from our own kitchen garden. The fresh methi leaves looked so good dotted with morning dewdrops sparkling like diamonds. My mom used to make variety of parathas (specially on winters).Using fresh methi leaves enhances the flavor and gives a to the parathas. These taste best when served with plain yoghurt, pickle or with some chutney. I don't put salt in the methi leaves, neither do I squeeze out the water to take out the bitterness because (by doing so all the nutrients will be lost). I feel happy to see when my son also enjoys this tasty paratha. Rinse the methi in water thoroughly to get rid of the soil particles. Chop the leaves evenly. Make a paste of fresh coriander leaves, green chillies and ginger in a blender. Now in a large mixing bowl add chopped methi leaves and all ingredients (mentioned above) along with the paste. Put little water in the bowl as per the absorbency level of the flour. Do add ghee to the dough to make it soft. Cover the dough with a moist cloth and leave it to rest for 20 minutes. Make equal s balls of the dough (equal sized). Roll the ball into thin round shape (like chappatis). Sprinkle flour to dust if the dough is sticking to the chakkali. Do the same with all the balls to make round parathas. Now in a non-stick pan, cook the paratha on medium flame on both the sides by applying oil. Make the rest of the parathas in the same way. Serve the hot parathas with pickle of your choice, chutney or yoghurt. 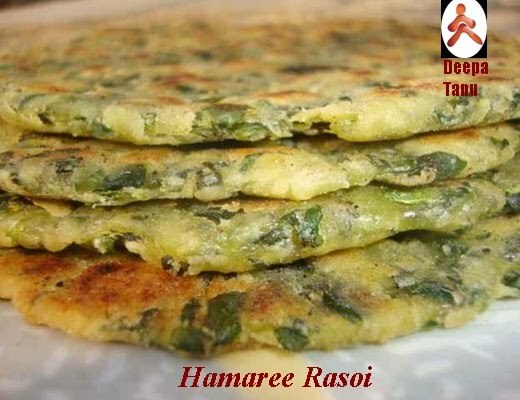 read more.. "Methi Paratha (Fenugreek Indian Bread)"
Parathas /Indian Bread have an important role in North Indian's Kitchen. 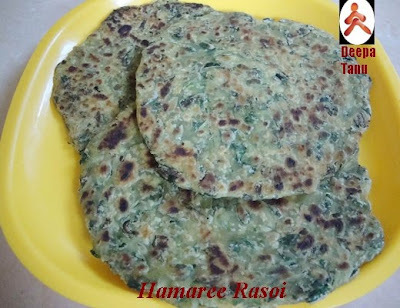 Though there are plenty of varieties, when it comes to parathas like- Aloo ka paratha, Methi paratha, Gobhi paratha, Mooli paratha and so on....this Lachha Paratha is going to win your heart once you try....Originated from the Northern region of India, the speciality lies in the crust and crispy flakiness of the paratha. Though it does take some time to make the layers, but the end result is absolutely fantastic and worth the time consumption. Parathas are heavier than 'phulkas /chapatis' and comes in various shapes and flavors. The trick lies in kneeding the dough. I always use warm water to kneed the dough, as this helps to obtain a softer texture. 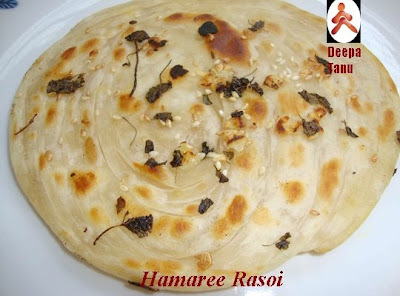 Sooner I will post other types of parathas as well. Mix 2 cups of all purpose flour, 1 tbsp ghee, salt and warm water to knead a soft dough. Spread little oil on top, cover with a muslin cloth and keep aside for 20 minutes. Now divide the dough into equal parts. Roll out the dough into a thin roti spread 1 tsp ghee evenly over one side. 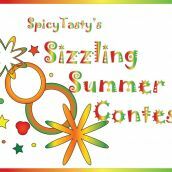 Sprinkle a pinch of red chilly powder and chaat masala. Now fold this chapati like a paper fan (like shown in the picture). Press and roll out into a chapati shape. Remember not to flip as it is rolled only from one side. Before hitting it on the tava for frying, sprinkle some garlic flakes, sesame seeds and dry fenugreek leaves (for garnishing) and lightly press with a rolling pin over the paratha. Now roast the paratha on the tava and allow it to become brown and puff on the bottom before turning once. Pour little oil and roast both the sides till light brown. Put is aside using a spatula and drain on paper towel. Follow the same with the rest of dough balls. Then serve these crispy lachha parathas with veg /non veg side dishes and pickle for a light supper or lunch. read more.. "Lachha Paratha (Layered Indian Bread)"
read more.. "Reposting--Mango Delight : Mango Sauce with Vanilla Ice- Cream"
Pre heat the oven prior to cooking for about 10 minutes on 180 degree celsius. In a blender make a paste of onion and garlic and keep aside. Now make another paste of tomatoes, ginger, green chillies and keep aside. Heat oil in a pan, add the onion paste and fry till it is light brown. Add coriander powder, red chilly powder,salt, pepper and fry for a minute. Add tomato paste and fry till it leaves oil. Pour the curd and stir it fast so that it doesn't cuddle. Add fresh cream and mix well. The masala should be little watery. Now place the masala on an aluminium dish and break the eggs gently on top of this masala, keeping the yolks entire. Sprinkle some coriander leaves, salt and pepper over the whites and bake it for10-12 minutes on 180 degree celsius (till the yolks are glossy). This is sure to be enjoyed in all seasons for breakfast , lunch or dinner. You can enjoy this delicious baked dish with fresh baked rustic bread.